Unfortunately there are no golden rules when it comes to identifying unfamiliar mushrooms, edible or otherwise. Deadly poisonous toadstools can share the same characteristics as many edible fungi. Of course, many genera of mushrooms have familiar and reliable traits, but it is always best to know all specific features. Some species, such as the Giant Puffball are easily recognisable, but instantly evident species like this are few and far between. If you are interested in mushrooms to eat, a good rule to follow is this: IF YOU DO NOT KNOW ITS NAME OR HAVE ANY DOUBT ABOUT ITS IDENTITY, DO NOT EAT IT. This is purely for safety reasons. Enjoying wild mushrooms as food or as a casual interest can be very rewarding – it is just common sense to employ a smart, non-complacent attitude when dealing with new discoveries. The following information can help overcome basic identification obstacles and covers the common mushroom-shaped species – those with a typical cap and stem. Note: make sure you have found a prime, mature specimen rather than very young or old, as appearances change with age. Look around for other specimens to ascertain if you’ve found the best example. To help break things down and help as a ‘process of elimination’ from the facts, I have categorised these ID tips into 3 sections. 3. TAKING A SPORE PRINT – A fungal footprint! Identification tips from the bits! Size and Shape: Dimensions (width & depth)? Is it flat, round, domed? etc. The following illustration is featuring cap morphology. It will give you an idea of all the different cap shapes out there. Note: Sometimes one or more features are present on the same mushroom – ie. some funnel mushrooms have a slight bump (umbo) in the centre. Colour(s): What colour or colours does it show? Does it also change colour when bruised or handled. Cut into the cap to see the flesh. Does it change colour when exposed to the air? Texture/Markings: Is it smooth, sticky (especially noticeable in wet or moist weather), shaggy, scaly, velvety? etc. Consistency: Is it hard, firm, fleshy, soft, spongy, fibrous, delicate, tough, crumbly? etc. Odour: What smells can you detect, if any? Typical Mushroomy smell, of meal, chemical like, fruity? etc. What features does the margin have (if any) ie. wavy, split, inrolled (curving inwards), turned up, striated (striped, grooved or ridged)? etc… Has remnants of the partial veil been left? The underside of your typical mushroom (with cap and stem) disperse their spores from here. They can have gills (blade like flesh), pores (small holes from the end of tubes which are hidden within the cap) or even spines (hanging spikes or teeth) from which the spores will drop. Colour(s): What colour are the gills. This can be sometimes tricky, as colours can change duringing stages of growth (ie. young, mature, old). Look around for younger or very old (dying) examples for comparison. Does the gill colour change when marked (with a knife or finger)? Is it blotchy or speckled? Spacing: They may be crowded and fine or thicker and spaced out. Thickness/consistency: Are the gills thick or thin? Are they fragile, strong, flexible or brittle? • They may be forked (gill ends fork out) closer to the margin. • Can they be easily peeled/removed from the stem? Pores: All of the Boletes and Polypores (bracket fungi) have pores instead of gills. These appear as small holes on the underside of the cap. Small tubes run through the cap from the felsh. • Note the pore size. Are they small and numerous in a small space of larger and wide spread. Size and shape: Is the stem thick, thin, short or noticeably tall (long)? Colour: Does it share the same colour (concolourous) as the cap or is it different? Are there coloured streaks? Does the colour differ at the base in relation nearer the apex (just before joining the cap)? Consistency: Is it smooth, flaky etc? Is it brittle, fibrous and flexible etc? Ring (Annulus): Is there a ring on the stem? Is it large, small, grooved, moveable? Does the stem have a different consistency above and below it? Markings: Any distinct markings? Pitting, freckling etc. Base: Is the base thicker where it joins the wood/soil? Does it have a sack or volva (remnants of the universal veil)? Does the stem appear to have an extension like a root below the soil etc? Other: Cut the stem. Is it hollow or solid? Is it darker near the base? Does the flesh change colour and where? Is it clustered and/or joined with other mushrooms at the base? Note: I would advise you only do this if you know the genus (taxonomic group) of mushroom you are dealing with. Nibble and spit: On certain occasions a nibble of a mushroom to gauge the sensation or taste is advisable. But care must be taken in this. I only use this technique on Brittlegills or Milkcaps, and unless you know you’re definitely dealing with these, do not try it at all. Taste sensations are usually in the form of unique sensations and flavours, ie. bitterness, hot and mild etc., which help in identification. A lot can be resolved simply by knowing where and when a mushroom is found. Habitat: The two main habitats are Wood and Grassland, but also make note what types. ie. Is it in broadleaved, coniferous or mixed woodland? Is the grassland in an urban setting such as a garden or roadside? Is it in a meadow, pasture field or near a hedgerow? • Does it grow in soil/grass or on dung etc.? • Does it grow on wood chippings, compost, sawdust etc? • Is it growing nearby a tree(s) – What is the tree variety? • Is it in a clearing (grass or leaf litter etc.)? • Does it grow on a living tree? • Is it on a dying or dead tree? Is it on a tree stump? • Is it growing on dead wood, fallen branches or twigs etc.? Time of year: The main mushroom season begins from late summer through to early winter, but many may grow earlier in the season, starting in the Spring/Summer. Others (especially bracket fungus) can last all year round and winter is host to a few exclusive (and edible) species. Simply make a note of when you make your discovery. Mushrooms and all fungi often (but not always) choose the same time and place to appear every year. Before you reach for the microscope, which, let’s be honest – most of us don’t have, taking spore prints can be the ‘make or break’ solution for any identification. 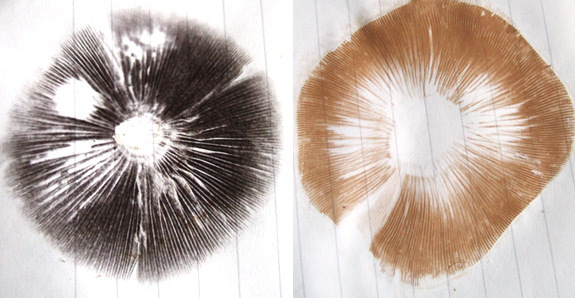 All you need to see is the ‘colour’ of the spore deposit (reproductive spores dropped from the underside of the cap). If you have not done this before, it’s very easy to do. Simple example: Once you have your mushroom back at home, simply cut off the stem as close the cap as you can. Place the cap (gills down) on a sheet of blank white paper or card. Leave undisturbed for 2-3 hours. When the time is ready, simply remove the cap from the paper to see the results. There are naturally many variations in colour, including white or pale pink. So it’s sometimes best to place the cap over both black and white coloured paper. White spores will be more noticeable on a darker background. If you do not wish to remove the stem, simply cut a hole in some cardboard (or heavier weight paper), slot the stem through the hole and place the card on the rim of a tall glass so the mushroom is gently suspended on the card. It’s also best to make note of the sometimes subtle variations of the same colour produced by several species. ie. you will encounter many ‘brown’ shades, ranging from very light/pale, medium to strong or rust-like. There are also many white to cream colour variations too. From all the information you have gathered you will have a much better idea of what you’re dealing with. I may not have covered all my finds within this blog for you to look at, but at least you will have a good collection of notes to cross reference with when checking other online sources and books etc. It’s all good.